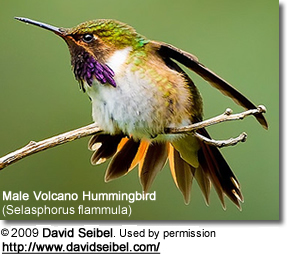 The "hummingbird's" name is derived from the characteristic hum made by their rapid wing beats. They are often simply referred to as "hummers." The species were often named for their physical characteristics, such as Fiery-tailed Awlbill, Ruby-topaz, Glittering-bellied Emerald, Brazilian Rub, Green-crowned Brilliant and the Shining Sunbeam. 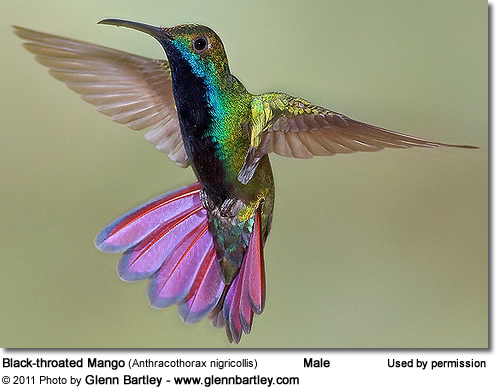 Others were named for their particular locations, like the Mangrove Hummingbird found only in mangrove swamps. Other languages named them for either physical traits or feeding habits; for example in Portuguese, hummingbirds are known as Beija-Flor (translated: Flower Kisser); in Spanish, they are known as Chupaflor, Picaflor or Joyas Voladoras (translated: Flower-Sucker or Poker, or Flying Jewels); in the Caribbean, they are commonly referred to as "El Zunzun" (translated: ‘going fast’) - in reference to their quick movements. 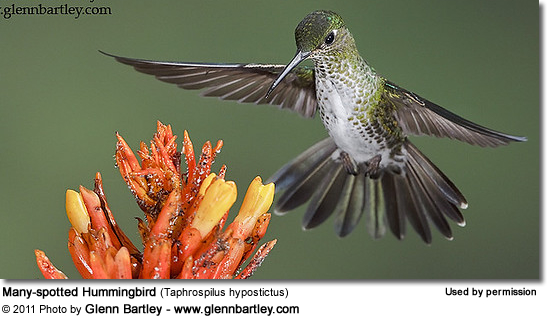 A group of hummingbirds has several collective nouns, including a "bouquet", "glittering", " hover", "shimmer", and "tune" of hummingbirds. German, Danish, Finnish, Hungarian, Norwegian, Swedish: Kolibri ... Spanish / Italian: colibrí, Chupaflor, Picaflor or Joyas Voladoras ... Portuguese: beija-flor ... French: oiseau-mouche ... Dutch: Kolibrie ... Russian: ??????? ... Chinese: ? ?, ?? ... Japanese: ???? ... Korean: ?? ... Czech: Kolib?ík ... Hebrew: ???-???? ... Persian: ???? ???? ??? ?